Zimbabwe's First Lady, Grace Mugabe, has denied assaulting South African model Gabriella Engels with an electric cable in a Johannesburg hotel suite last month, saying an "intoxicated and unhinged" Engels attacked her with a knife. President Robert Mugabe's wife Grace addresses a rally of ruling ZANU (PF) in Chinhoyi, Zimbabwe. 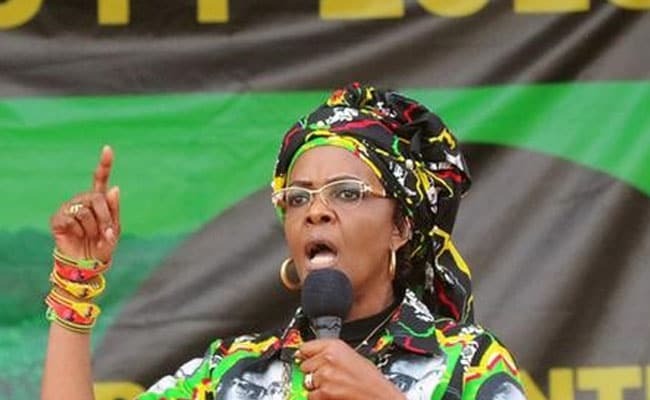 JOHANNESBURG: Zimbabwe's First Lady, Grace Mugabe, has denied assaulting South African model Gabriella Engels with an electric cable in a Johannesburg hotel suite last month, saying an "intoxicated and unhinged" Engels attacked her with a knife. In a previously unreported Aug. 17 deposition seen exclusively by Reuters, Mugabe countered 20-year-old Engels' version, portraying herself as the victim after intervening on behalf of her adult sons Chatunga and Robert Junior who were "in trouble with a drunken young woman". The statement said Grace Mugabe, 52 and a contender to replace her 93-year-old husband as Zimbabwe's president, was thinking about filing attempted murder charges. A group representing Engels dismissed the allegations as lies. According to the model, an irate Mugabe burst into the room where she was waiting with two friends to meet Chatunga on Aug. 13 and started laying into her with an electric cable. Photographs taken by Engels' mother soon after the incident showed gashes to the model's head. She also had bruising on her thighs. In her deposition, Mugabe dismissed Engels' version as "malicious allegations" and said she had been attacked after going to help her sons. "She was worried about them and went to see them at their hotel suite," the statement said. "Upon her arrival, Ms Engels, who was intoxicated and unhinged, attacked Dr. Grace Mugabe with a knife after she was asked to leave the hotel." "Security was left with no other option but to remove Ms Engels from the hotel suite," it continued. The statement also alleged that Engels had been in a fight with other women at Johannesburg's Taboo nightclub the previous evening and suggested that may have been the cause of her injuries. Afriforum, an Afrikaans civil society group acting on behalf of Engels, denied both accusations. "Gabriella never attacked Grace Mugabe in any way and she did not participate in the fight at Taboo," Afriforum said. "It is clear that Grace Mugabe is desperately trying to escape responsibility for her own violent behaviour by using lies to falsely portray the victim in this case as the perpetrator." South Africa granted Grace Mugabe diplomatic immunity, allowing her to evade immediate prosecution for assault, although Engels and Afriforum have challenged that decision, saying Mugabe was not in South Africa on official business. They also argued that assault was a "grave crime" that was not covered by diplomatic immunity laws. The decision to let Grace Mugabe return home caused a row in South Africa, with the opposition Democratic Alliance also going to court to overturn the immunity. According to Zimbabwean intelligence files seen by Reuters, Robert Mugabe lobbied his South African counterpart, Jacob Zuma, to have the issue "solved amicably" and out of court but was stymied by Engels' refusal to accept a settlement. "He is trying to avoid the embarrassment of his wife appearing before the court," one file, dated Aug. 30, reads. "The problem he is facing is that the woman who was assaulted is refusing to accept any money and she just wants justice to be delivered upon Grace." Afriforum lawyer Gerrie Nel - best known for prosecuting South African track star Oscar Pistorius over the shooting of his girlfriend - said last month Engels had been approached with a cash offer but had turned it down. The intelligence report is a part of a series of hundreds of files dating back to 2009 that have come from within Zimbabwe's Central Intelligence Organisation (CIO). Reuters has not been able to establish their original author or final audience. The Aug. 30 report said Mugabe was "changing his attitude" to the case and was now backing Grace while accusing Engels of impropriety. "Mugabe wants people to stop castigating his wife and calling her all sorts of names," it said. "Mugabe is saying that his wife acted in an angry mood like all other women who find their children being involved with sleeping with whores." Afriforum chief executive Kallie Kriel said this allegation was an "absolute lie" and part of a deliberate attempt by Harare to undermine Engels' credibility as a witness. A spokesman for Zimbabwe's presidency, which has direct oversight of the CIO, was not immediately available for comment. Zimbabwe's ambassador to South Africa did not respond to a request for comment. Zuma has denied any hand in the affair, telling parliament on Aug. 31: "I am not a lawyer. I don't know the point of law and I was not involved in this process. How it was done, I would be lying if I speculate." His spokesman declined to elaborate.